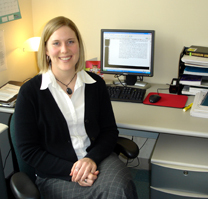 Cindy Stappenbeck obtained her Bachelor’s degree in Psychology from Niagara University in May 2000, and then continued her academic and research training at the University at Buffalo (UB), earning a Master’s degree in Psychology in May 2002. Upon completing her Master’s degree, Cindy obtained employment at the University at Buffalo’s Research Institute on Addictions (RIA) where she worked as a Project Coordinator for a large National Institute on Drug Abuse funded project. She entered the University of Texas and joined the SAHARA lab in August 2004. During her tenure as a graduate student, Cindy conducted both experimental and longitudinal research studies examining the relation between alcohol and dating aggression. She was awarded a Ruth L. Kirschstein National Research Service Award (NRSA) Pre-Doctoral Fellowship from the National Institute of Alcohol Abuse and Alcoholism (NIAAA) to support her research. Following a yearlong clinical internship at the Seattle Division of the VA Puget Sound Health Care System, Cindy completed a postdoctoral fellowship on a T-32 training grant in alcohol research from NIAAA at the University of Washington. She is now an Acting Assistant Professor in the Department of Psychiatry and Behavioral Sciences at the University of Washington where she continues to investigate the influence of alcohol on risk behaviors including aggression and sexual risk taking, as well as the interplay among alcohol, trauma exposure, and symptoms of posttraumatic stress disorder (PTSD).